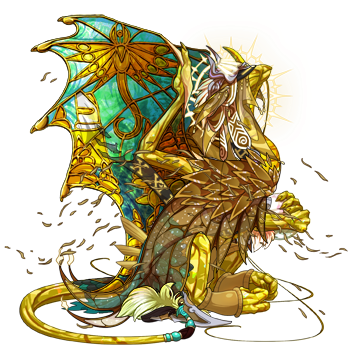 For the last installment of the color series, share up to three (3) dragons from your lair whose colors fall in the yellows and browns on the Flight Rising color wheel! Click here for this week's discussion thread and the Flameforger's Festival spotlight! first off is my pride and joy, bai! even though this kid is very, very yellow, i've always found it funny that none of his colors are in the yellow range - just that tiny little enclave of maize and cream on the other side of the color wheel. he's yellow nonetheless, since that's what i was looking for when i hunted for a good imperial to permababy - and i'd say he turned out quite nicely! i've yelled about his lore a lot, and many people probably know him already - from, uh, my signature, or avatar, or constant yelling. 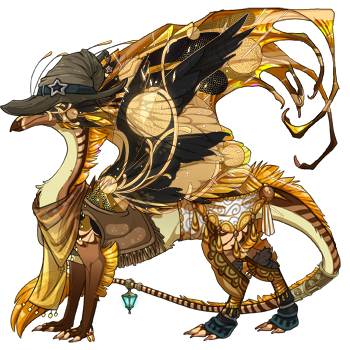 anyways, he's a hatchling emperor composed of three triplets! due to the circumstances of their life, death and subsequent resurrection, however, bai isn't... quite like most emperors. really, he's just an affectionate puppy who will steal your fish. out of my g1s, she's one of few to have lore! it's not much, but it's something. found as an orphan (which tends to be a thing, for g1 dragons), she never formed a lot of bonds during her upbringing, save for those with the animals around. eventually, this just kind of... became her job, and she now works as the familiar caretaker for the clan. lastly, here's brightshine! she's... yellow. extremely yellow. 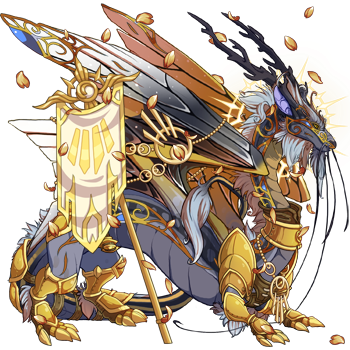 she's my light rep, so she kind of has to be - though the blue's been with her since... around last wavecrest. 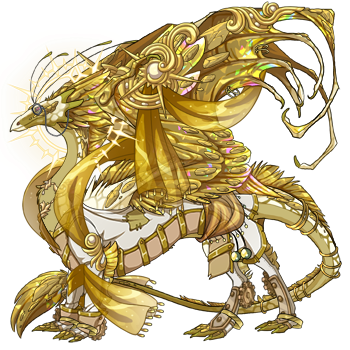 y'see, she used to wear the nouveau accent (from gg '17), but i got this shiny new one, and? she's perfect. i love her in every way now. as a true light lady, brightshine annoys everyone by sitting around and focusing on nothing but philosophy. if you approach her at the wrong moment, she'll ask you some deep and probably meaningful questions - if not, she'll just kind of stare at the sky while trying her hardest to be as mysterious as possible. I have this dragon here! He's a new one of mine, so he's unnamed at the moment. Archibald used to be a con-artist, but now he's a light cleric I suppose? The new brightshine apparel forced me to give him a makeover. 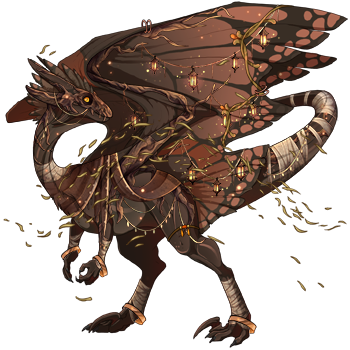 Lennie was a super lucky Christmas G1 hatch, along with this pumpkin boi, so my lore idea for them is that our clan's gardener dragon found the eggs they hatched from in a crate of seeds. The brothers have no jobs yet, but I'll figure something out eventually. last, but not least: Rebecca, our clan's architect! It's not easy to plan out the lair when it's built on a big volcano, so I respect the heck out of her. Hi, I'm Lup and I am obsessed with the colour umber (it was so hard to choose 3). He is called the Revenant because he came back from the 'dead'. Basically he was an enthusiastic miner whose greed led him to his demise. Obviously his name is a reference to the actor. This is Vesuvius, my dream permabab! He needs the hex gene but I still love him. It took a while to breed him but I am happy with how he turned out. Taking a break from the umber dragons... this is Helen, who is the secretary. She is shiny! [url=http://flightrising.com/main.php?dragon=43350605] [img]http://flightrising.com/rendern/350/433507/43350605_350.png[/img] [/url]markus from detroit: become human[url=http://flightrising.com/main.php?dragon=42031750] [img]http://flightrising.com/rendern/350/420318/42031750_350.png[/img] [/url]gabriel! [url=http://flightrising.com/main.php?dragon=43209840] [img]http://flightrising.com/rendern/350/432099/43209840_350.png[/img] [/url]my mute florist!